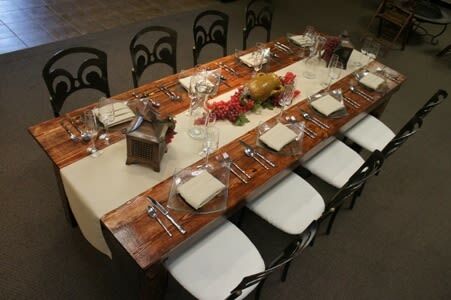 Rustic, elegant, and versatile, the harvest table is making an appearance in all party-planning spheres this year. 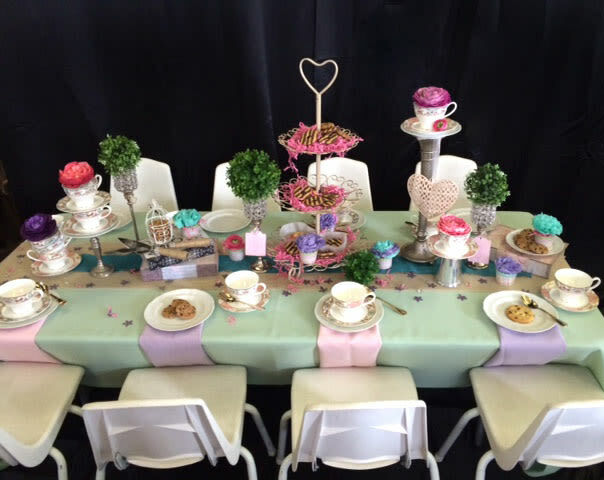 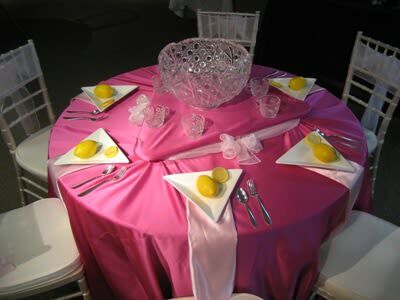 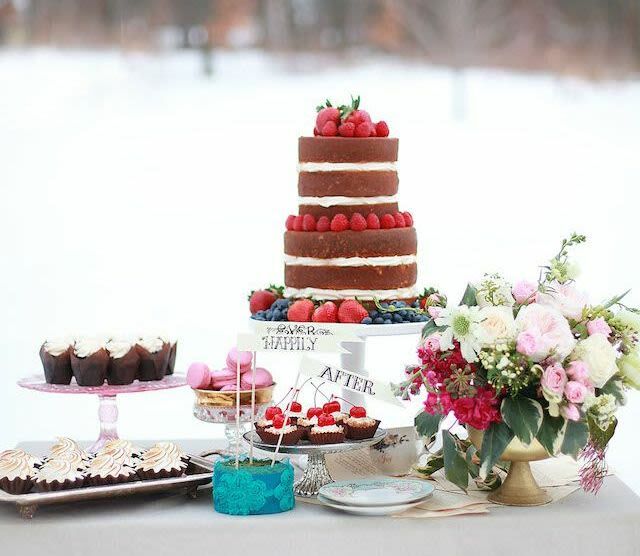 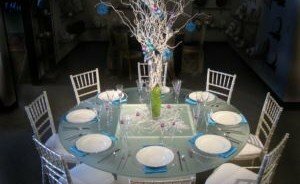 This table it suitable for all types of functions, from weddings to outdoor parties, and the wooden design provides a must-have look for Autumn and Winter events. 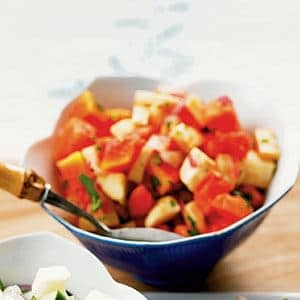 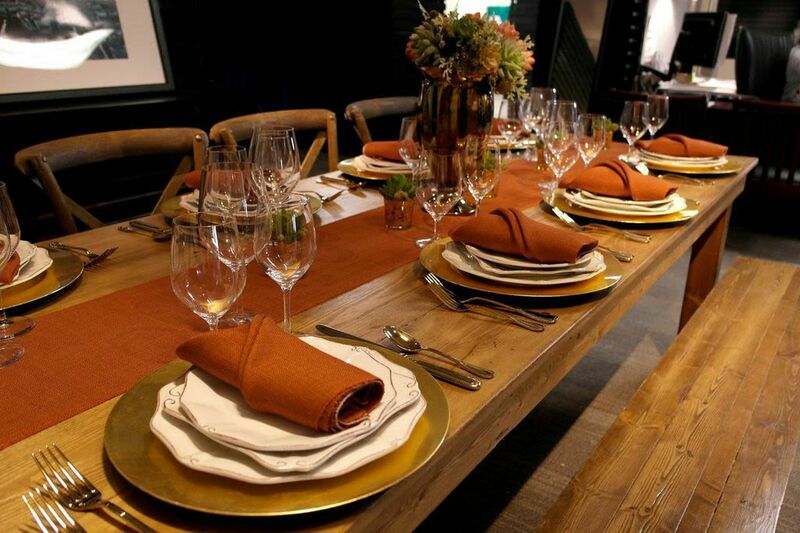 We’re sharing two events highlighting the harvest table’s classic form and multifaceted usability. 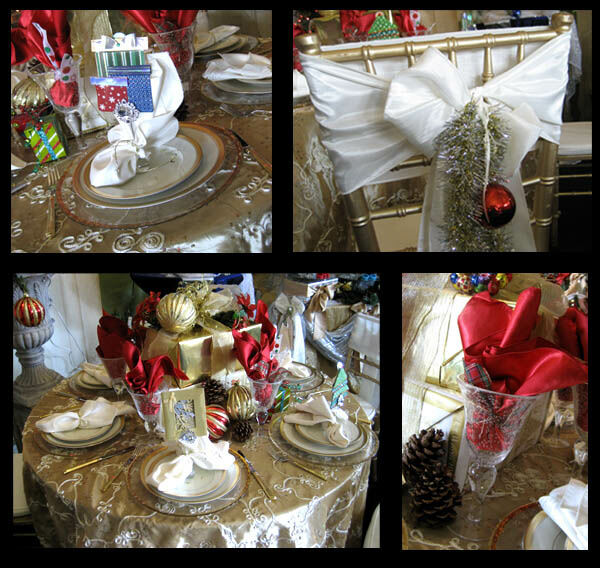 With Thanksgiving and Christmas on the horizon, Cindy, one of our talented Sr. 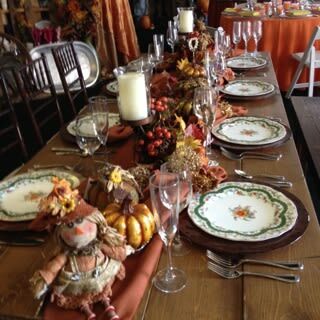 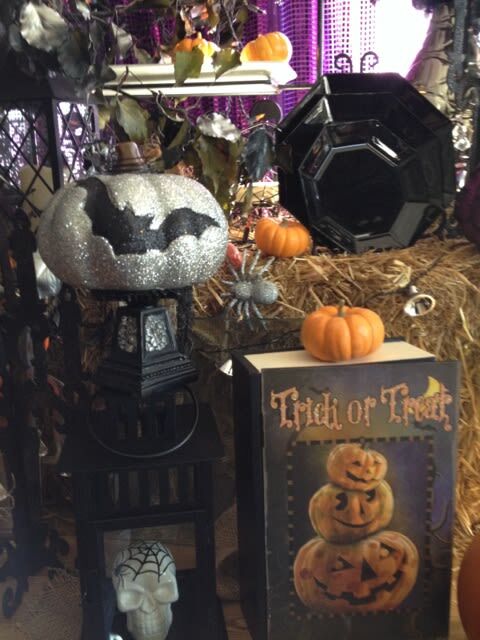 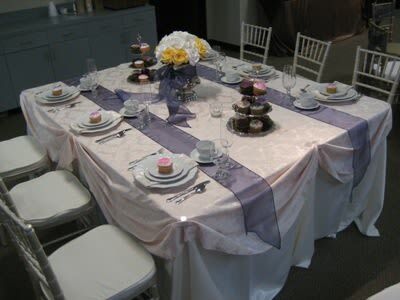 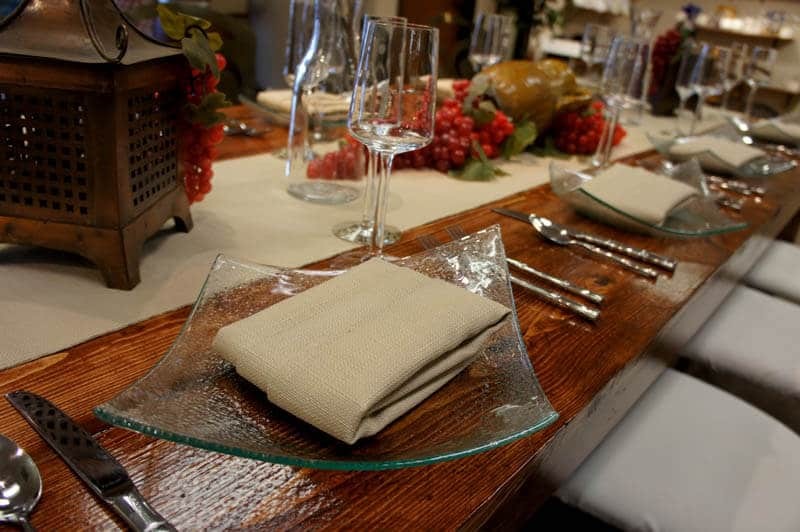 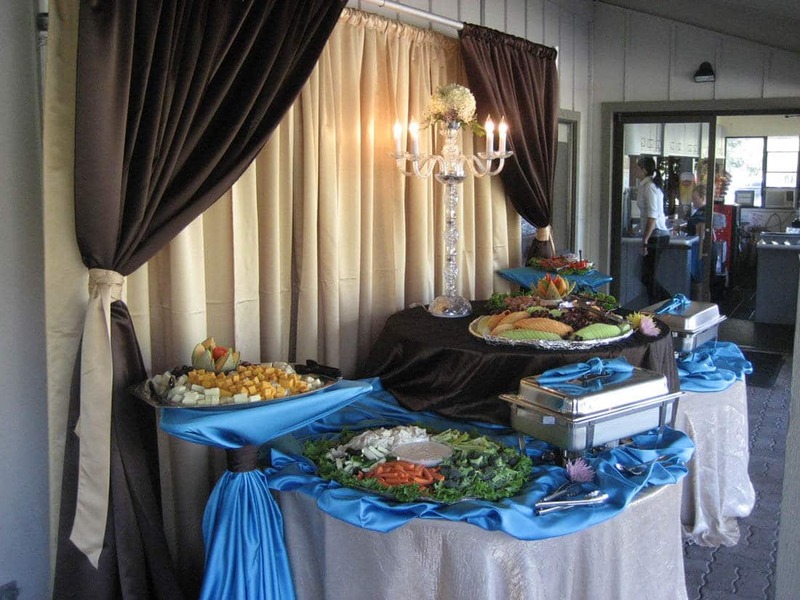 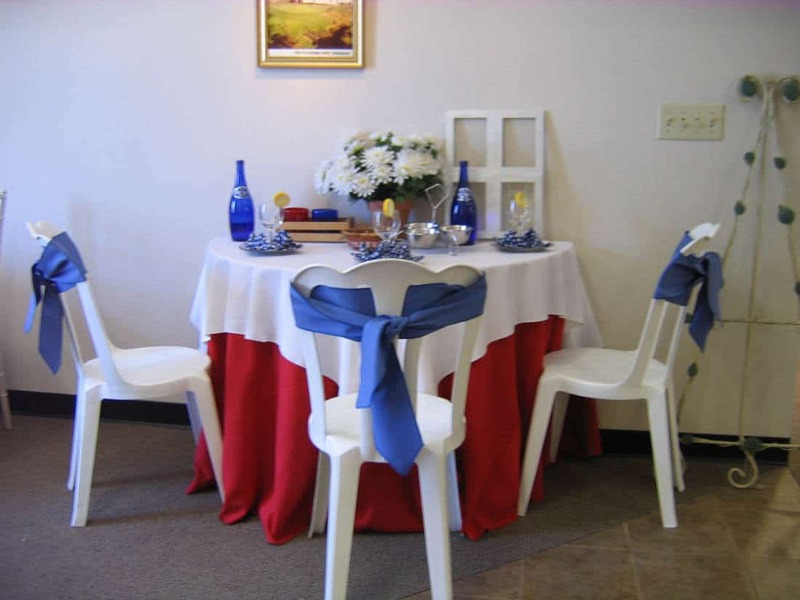 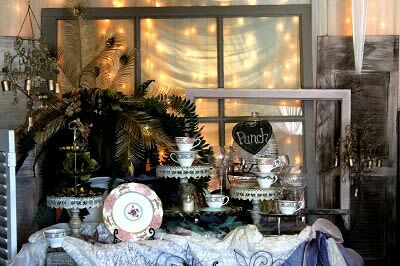 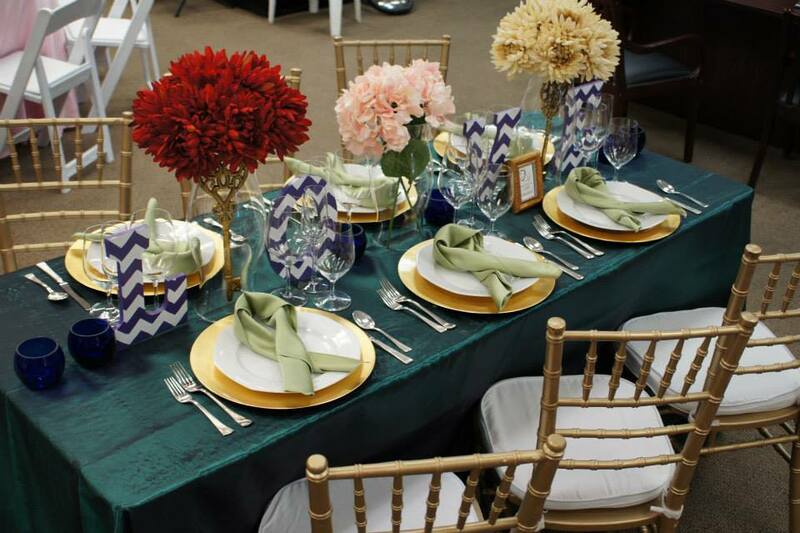 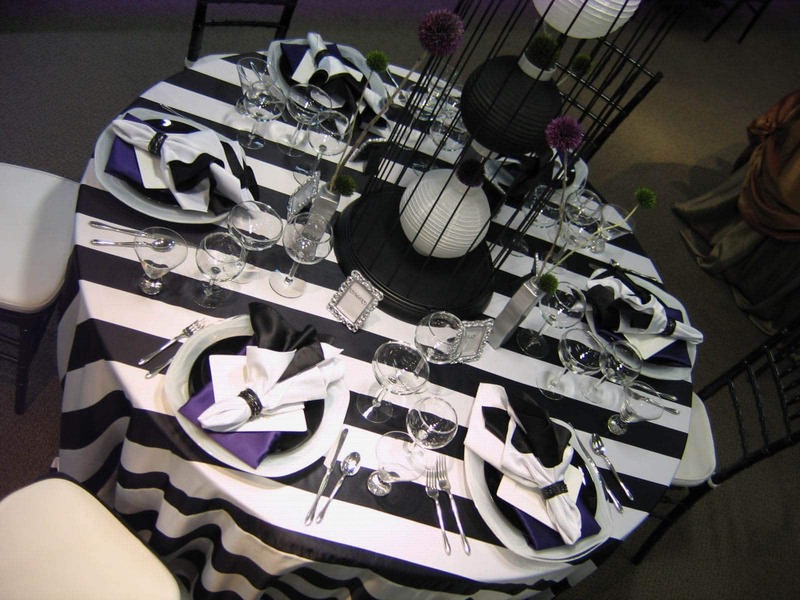 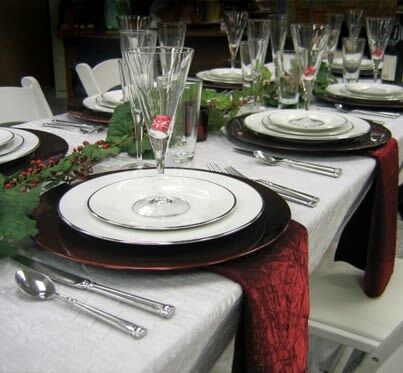 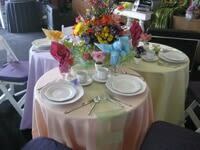 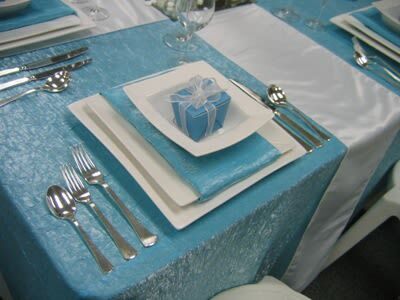 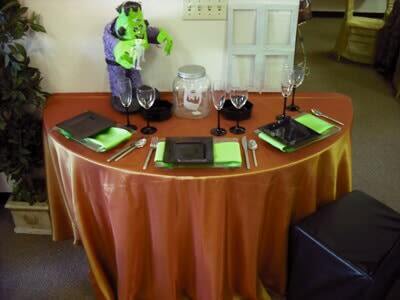 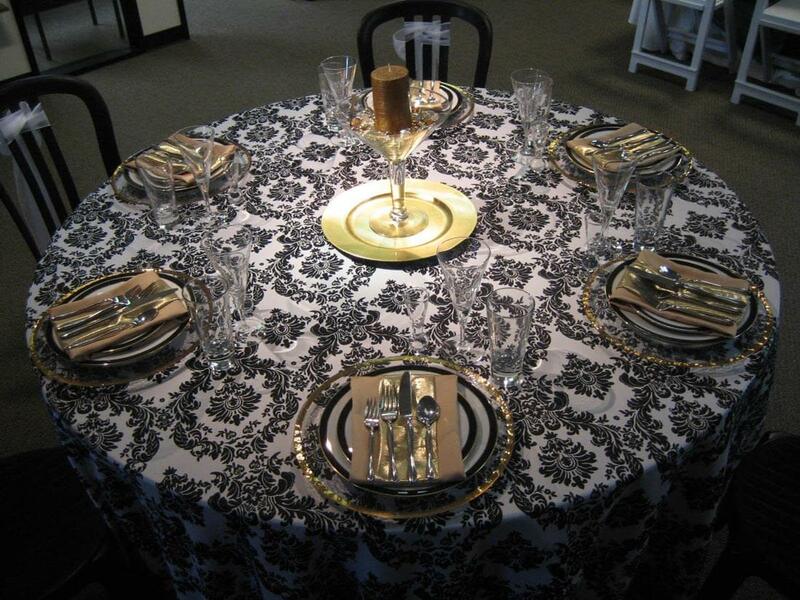 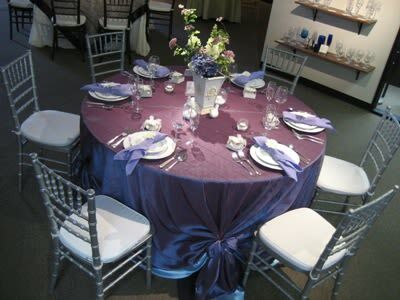 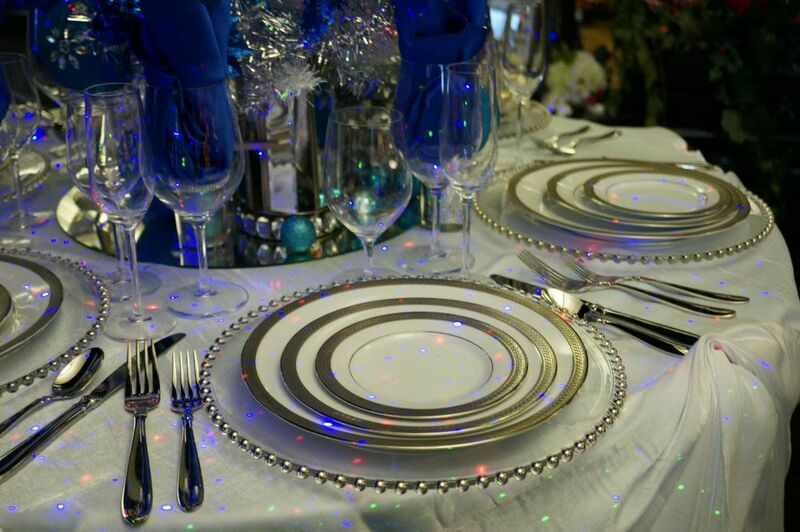 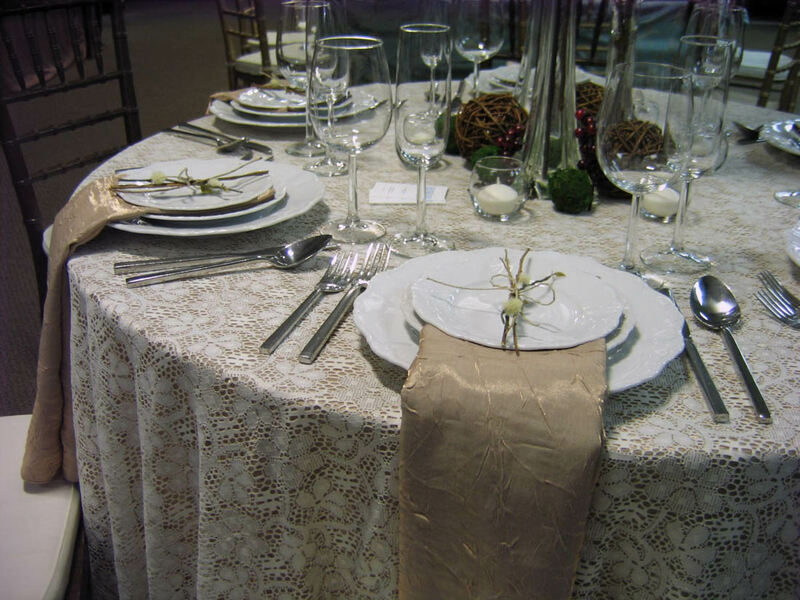 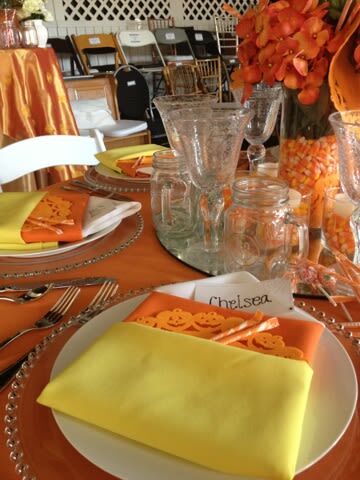 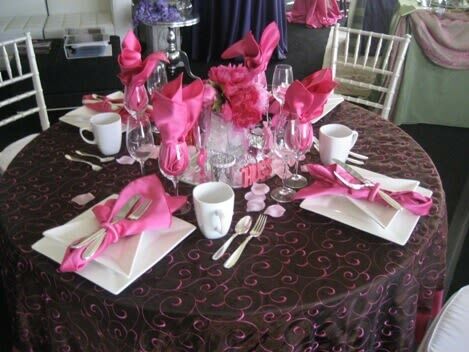 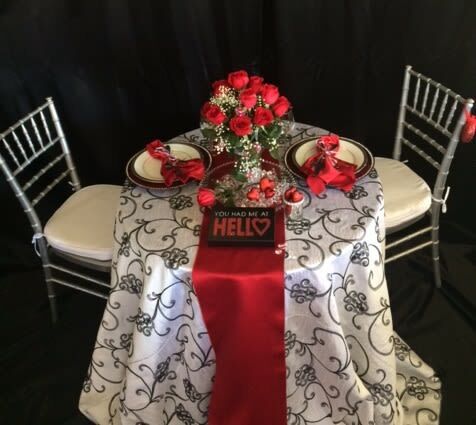 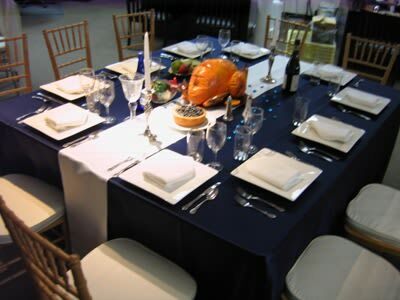 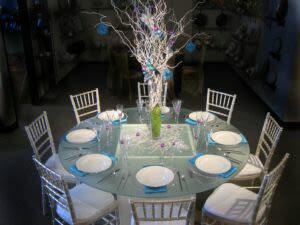 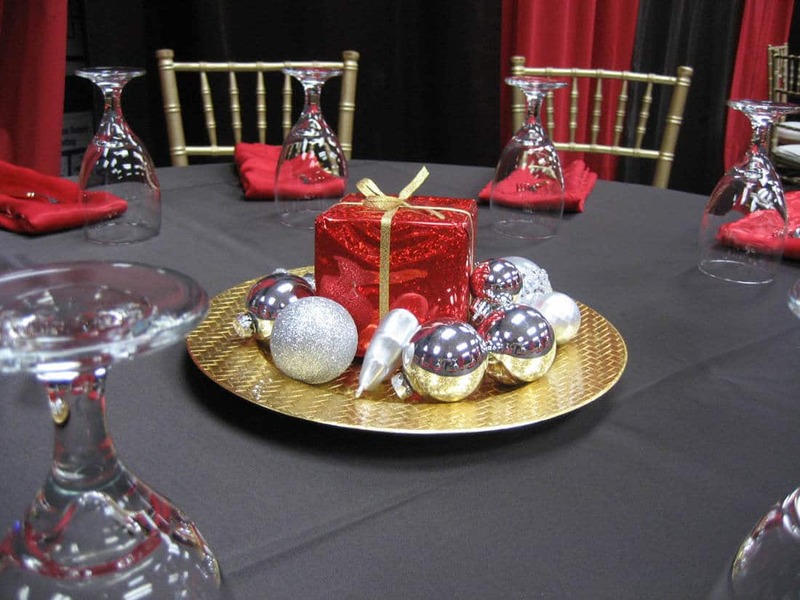 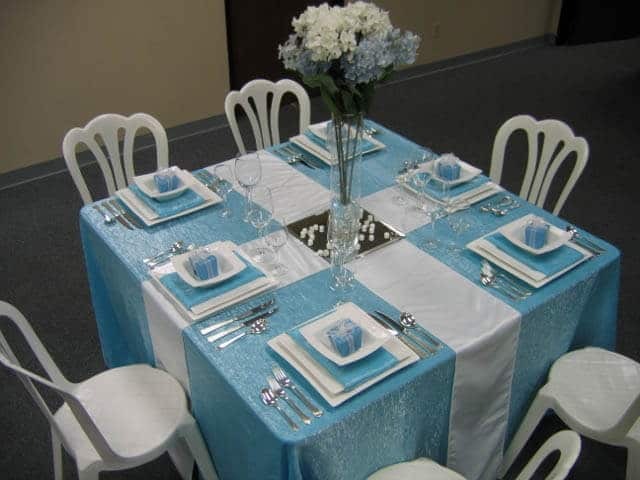 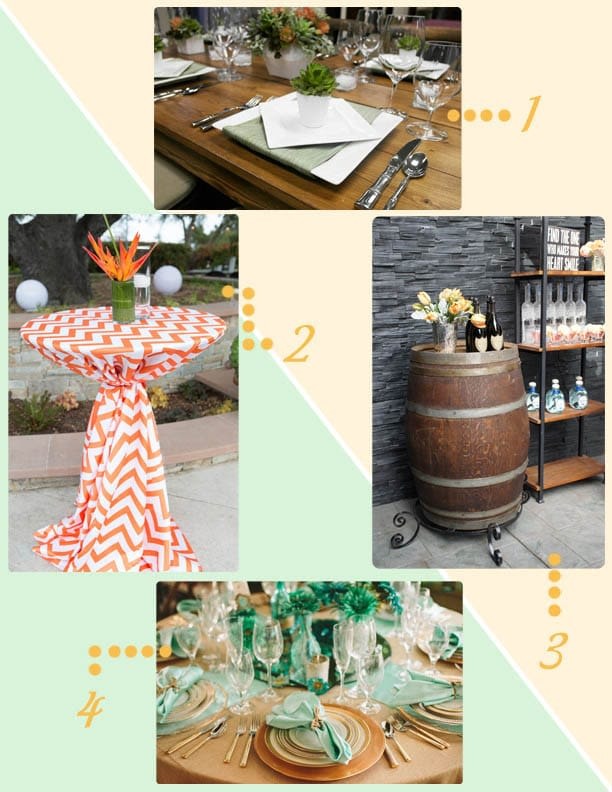 Event Managers, designed a festive tablescape featuring the harvest table, in our Castro Valley showroom. 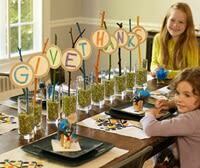 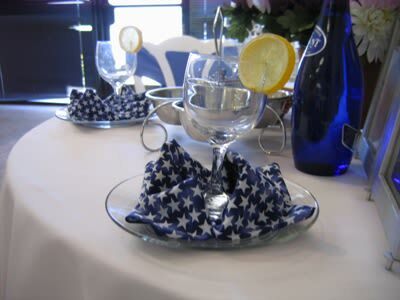 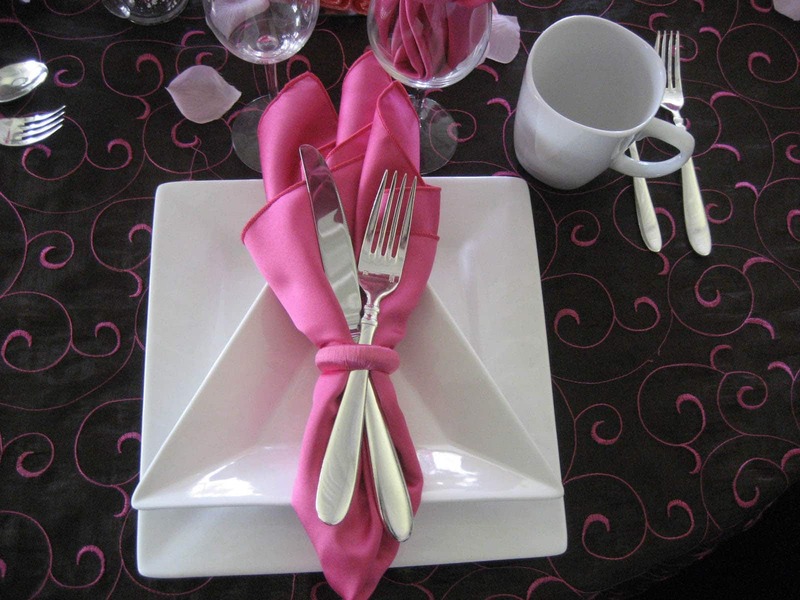 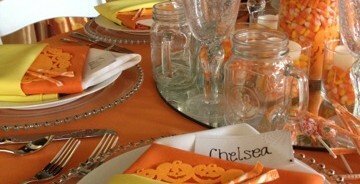 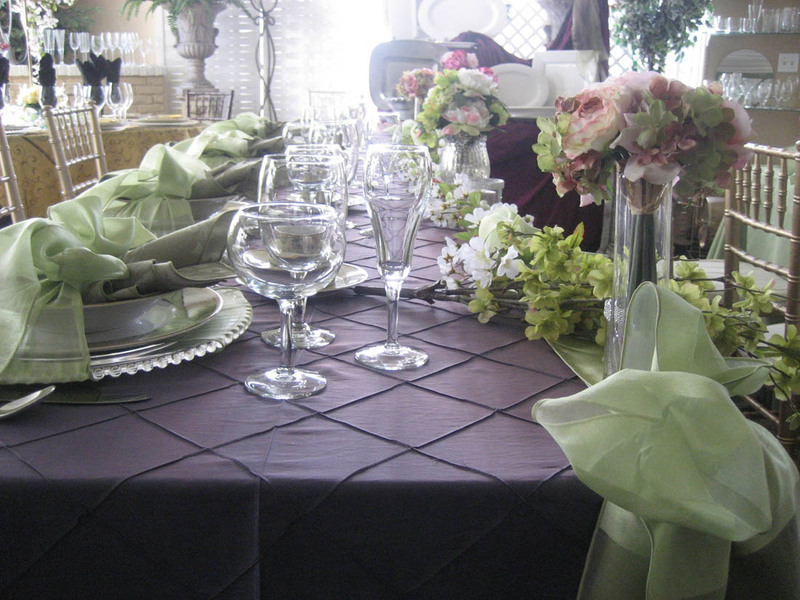 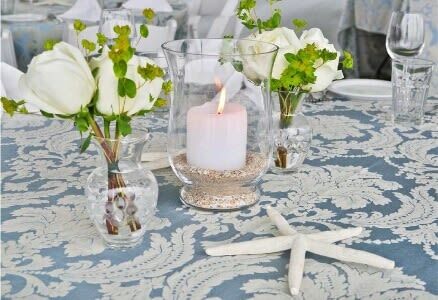 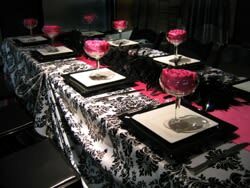 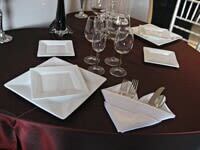 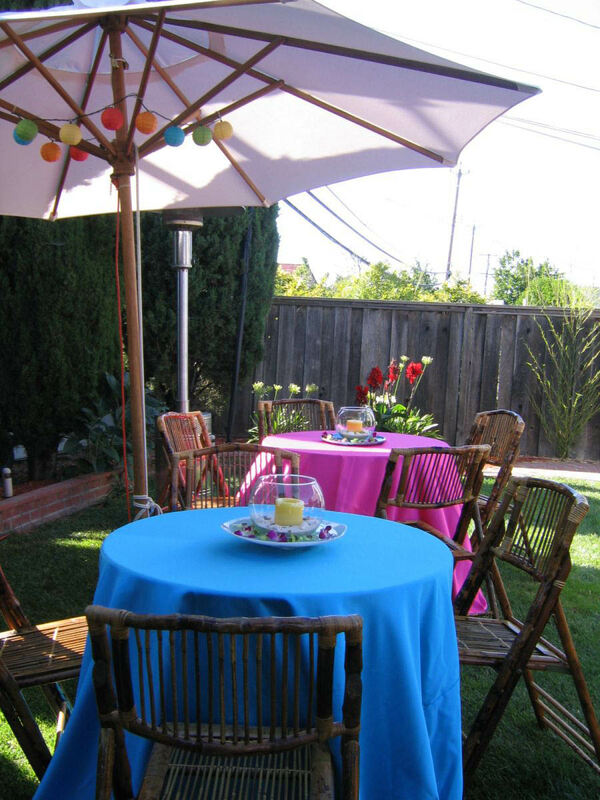 It’s generally best to style the harvest table with a table runner, which will enhance the rest of the décor nicely. 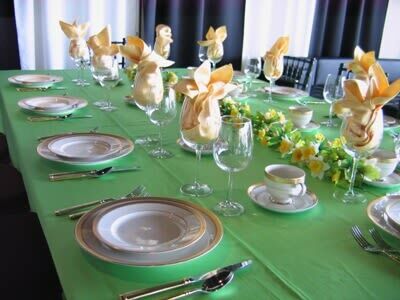 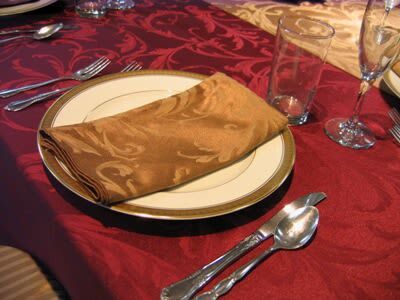 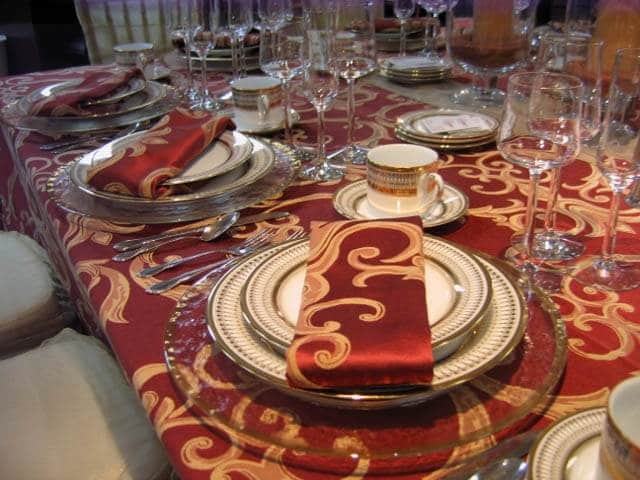 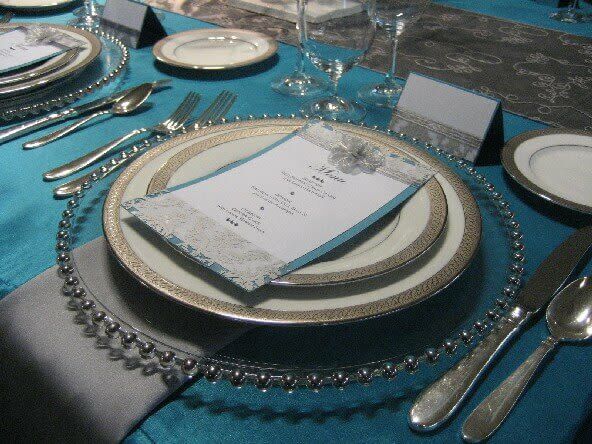 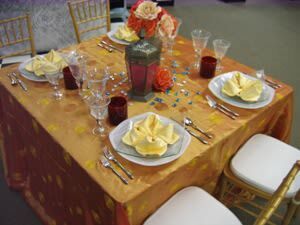 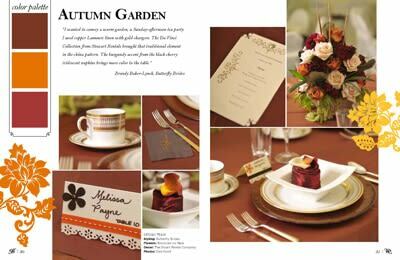 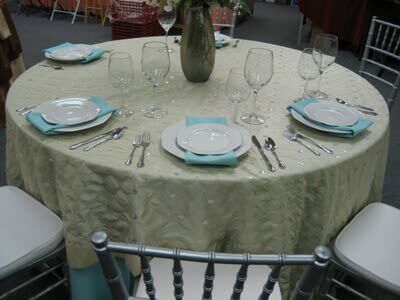 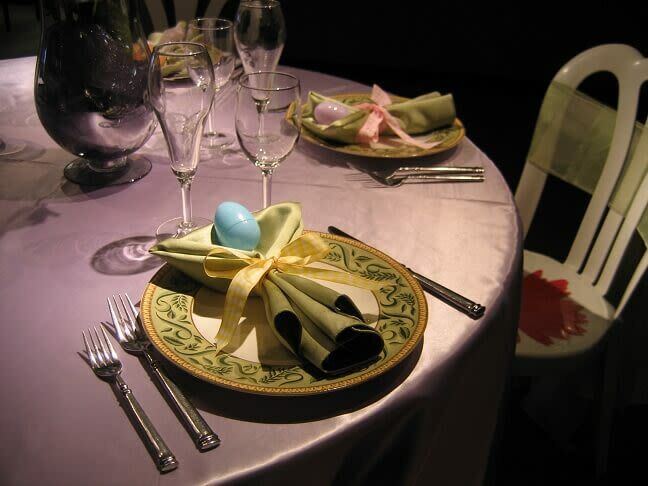 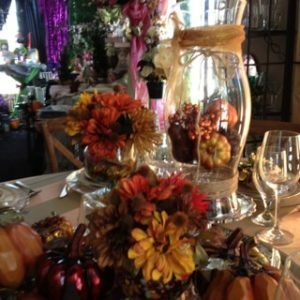 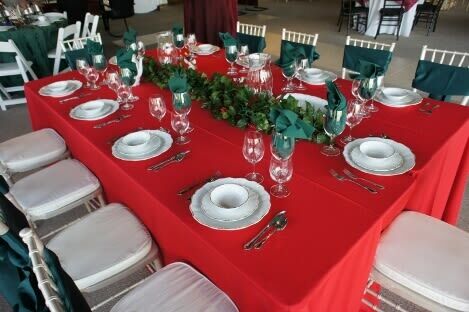 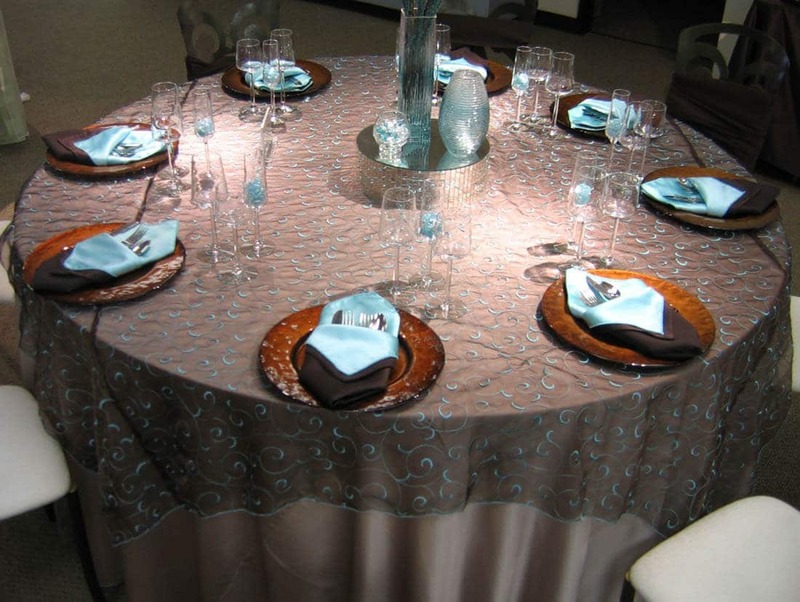 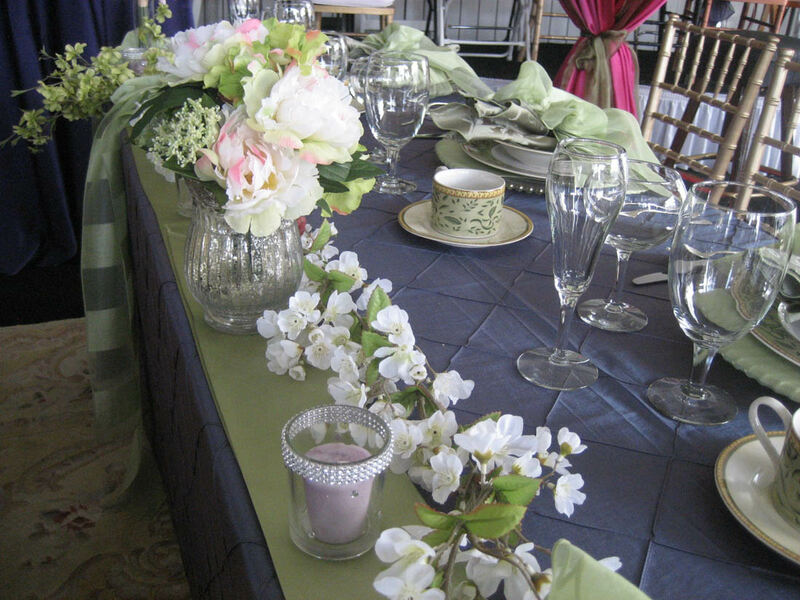 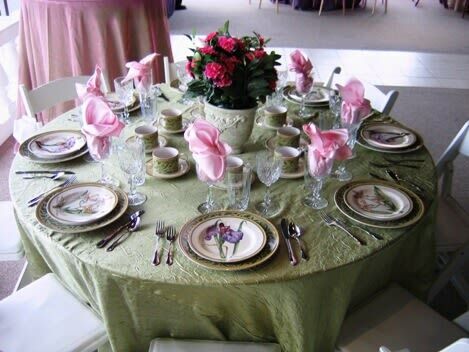 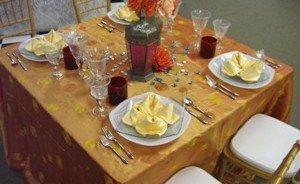 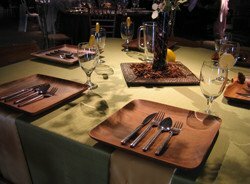 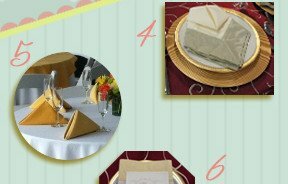 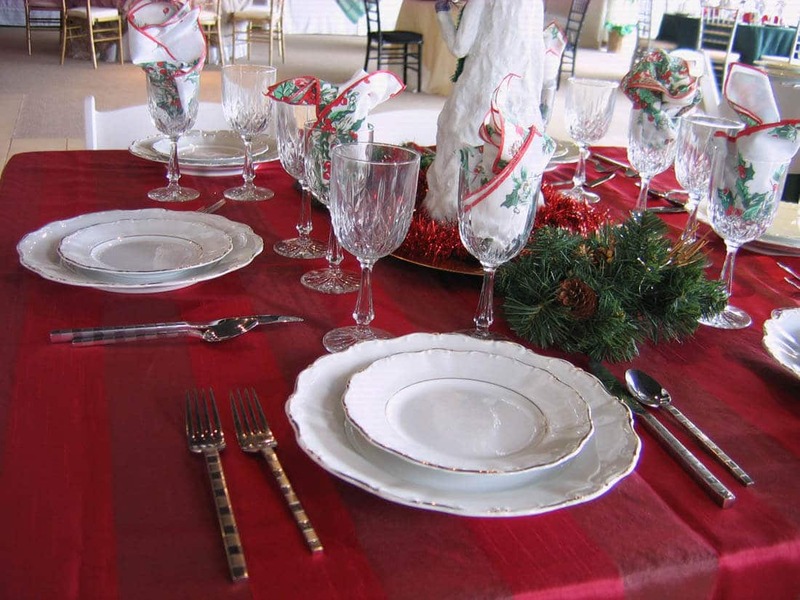 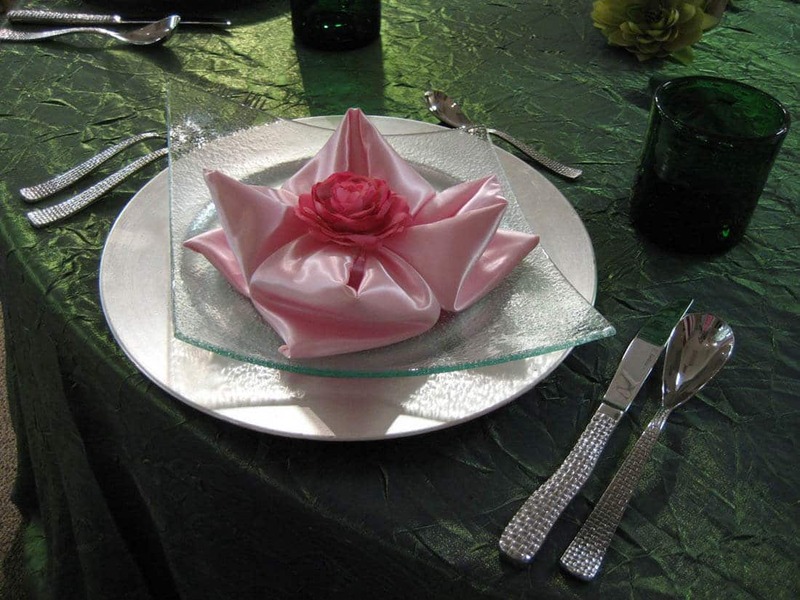 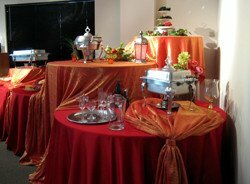 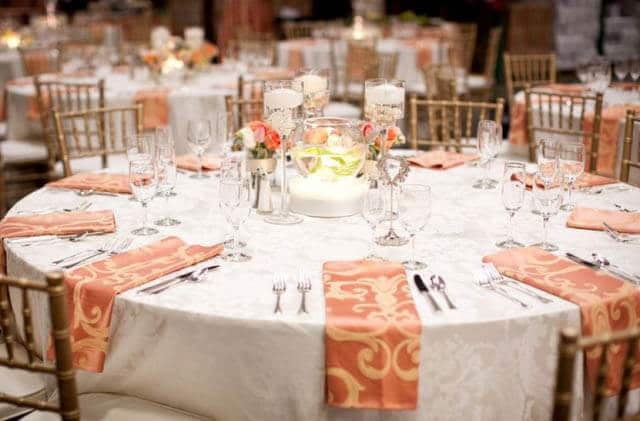 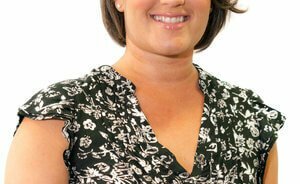 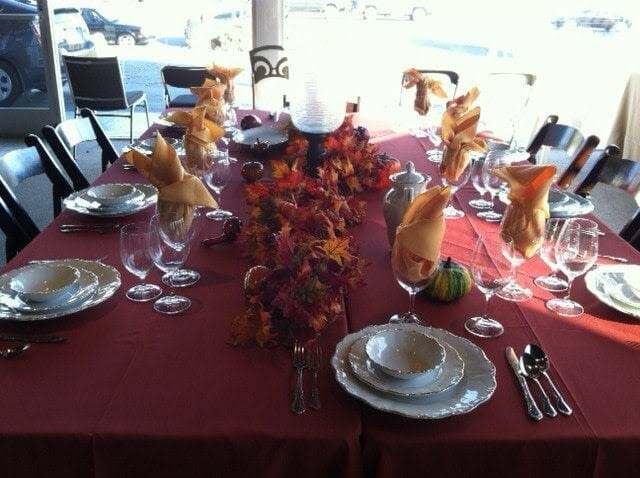 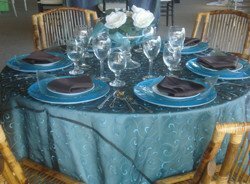 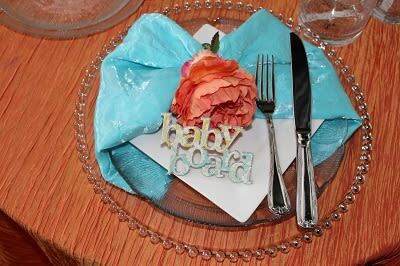 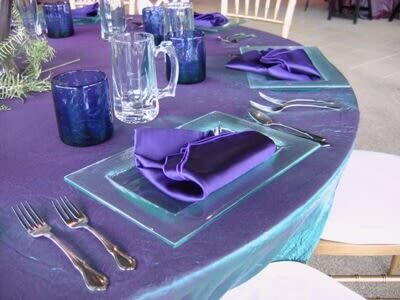 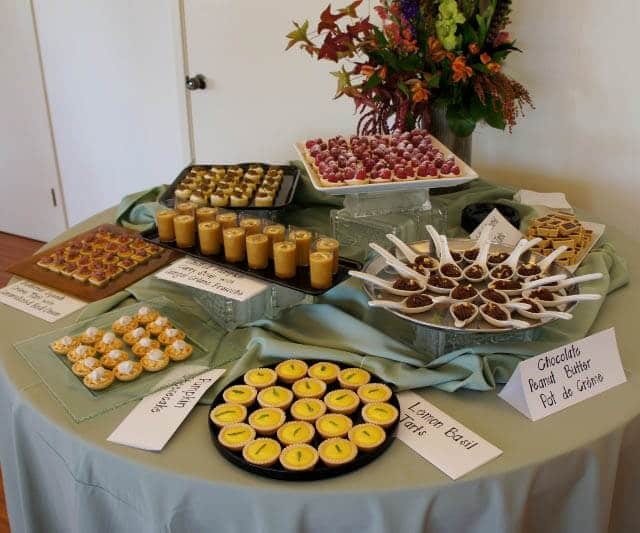 In this case, Cindy has used a subdued Rust colored Cedar Hill table runner, opting to have the central focus on the china and centerpieces. 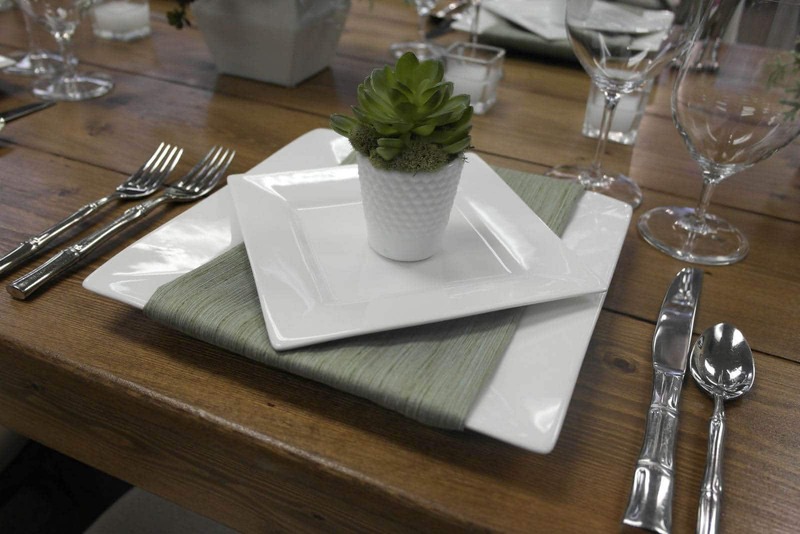 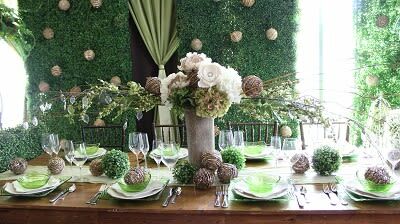 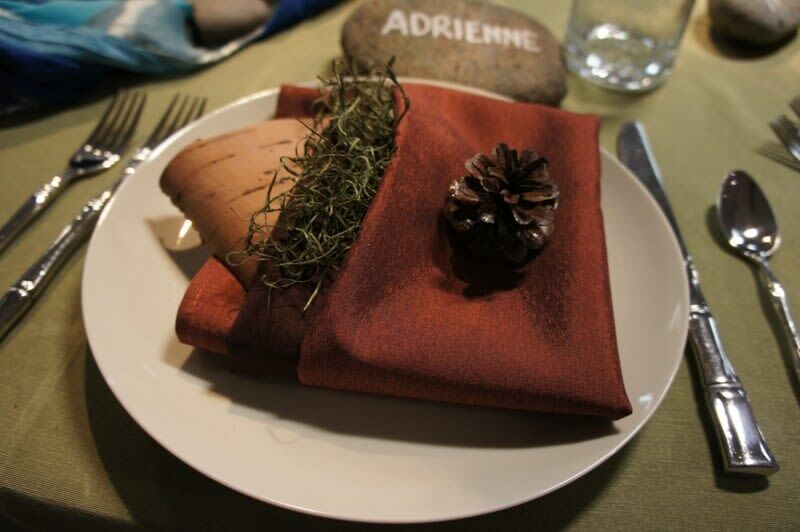 A palette of dark green, earth tones, and fall colors contributes to the rustic nature of the table. 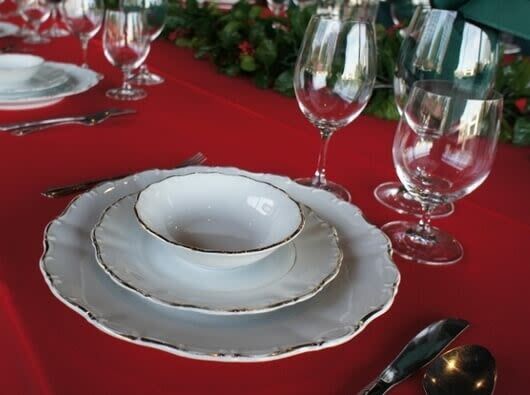 Our Victoria China in Clover rests atop antique copper glass chargers, providing the china’s elegant floral design with a richly hued background. 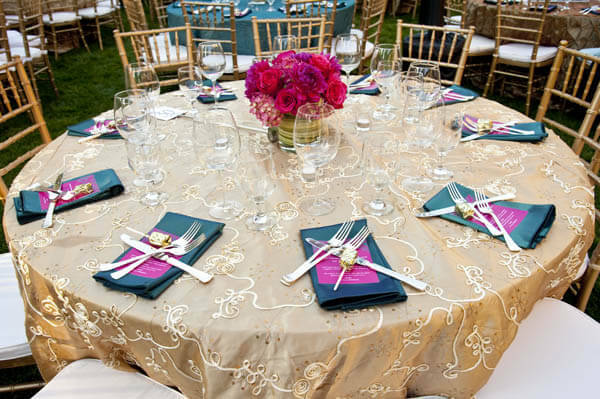 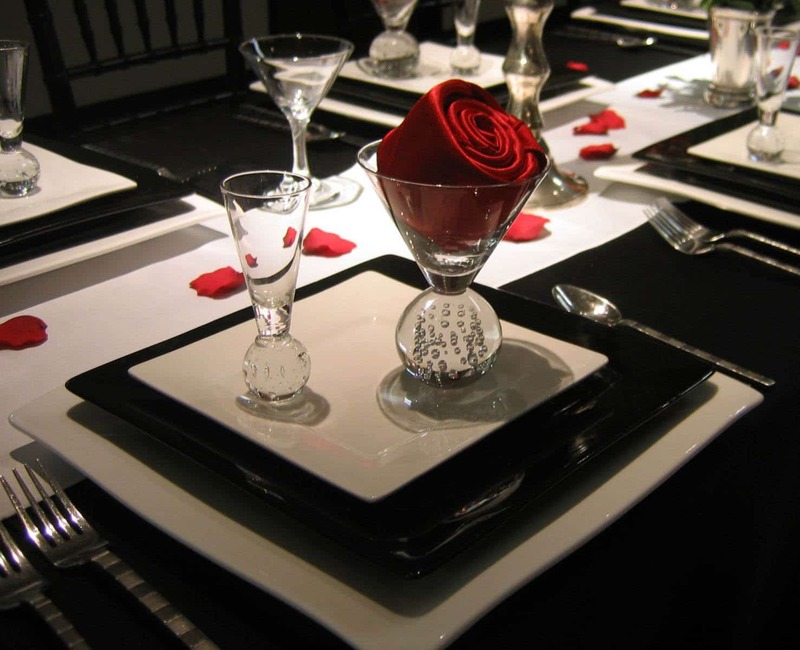 Simple glassware and flatware are placed around the china, directing attention to the extravagant and abundant centerpieces. 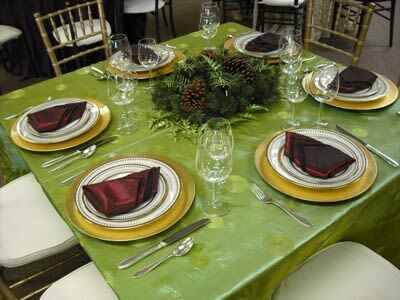 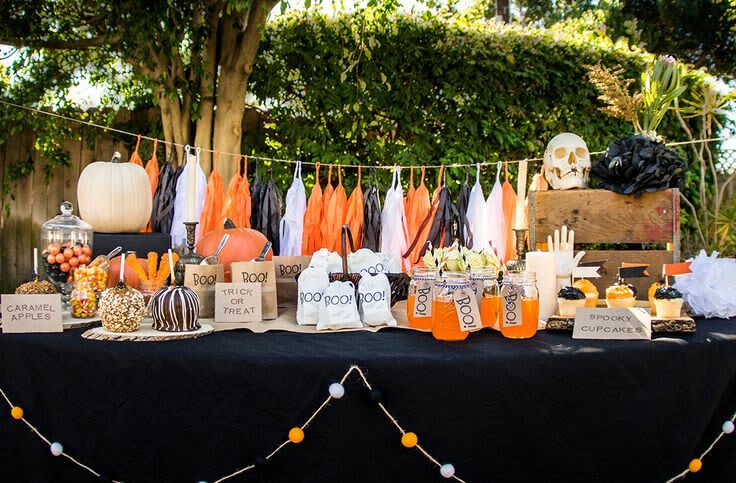 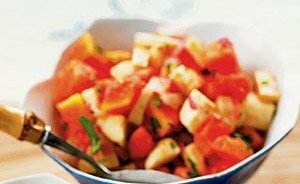 Linens, flowers, and leaves in shades of dark reds and oranges are scattered around candles and seasonal vegetables to create a festive and fun display. 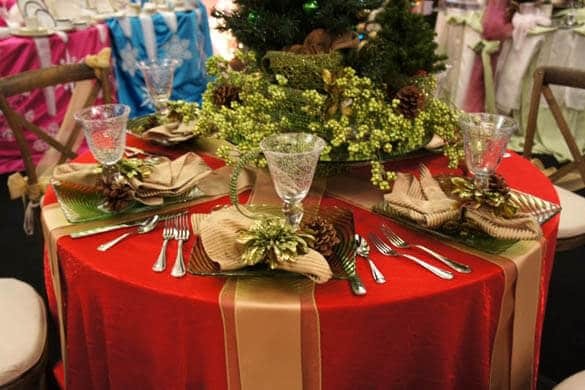 In the case of Cindy’s holiday tablescape, matching benches are paired with the table for a comfortable and communal atmosphere. 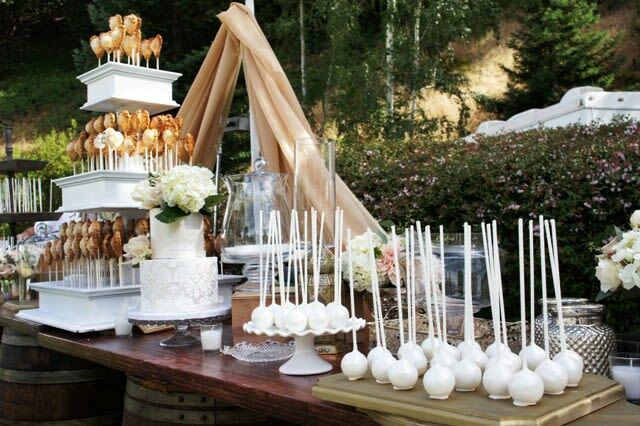 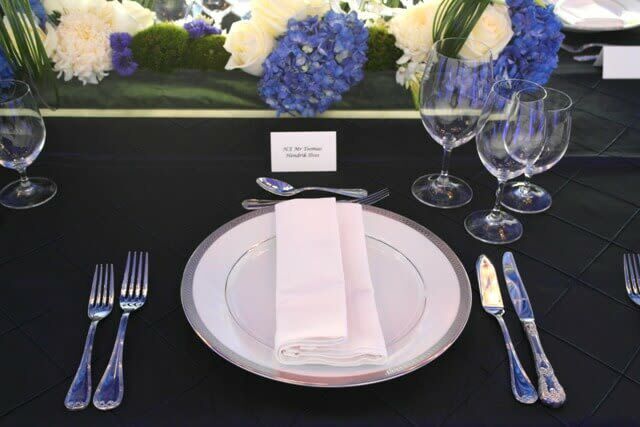 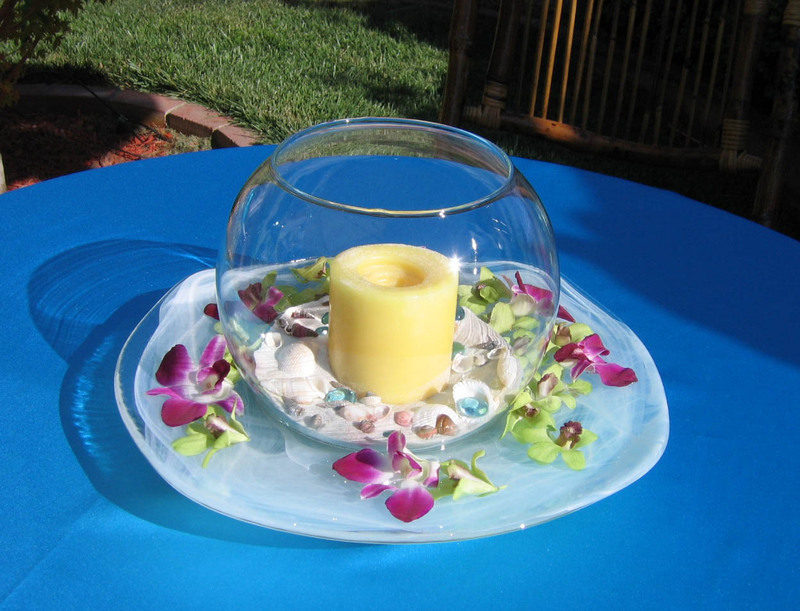 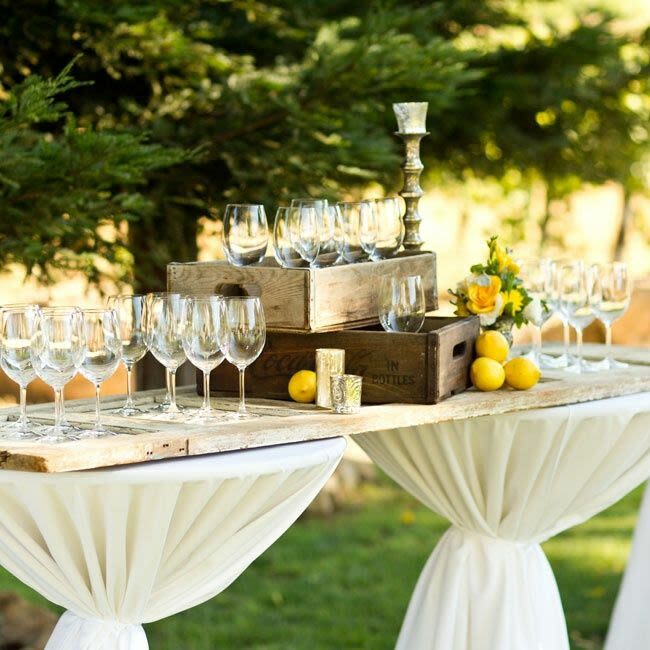 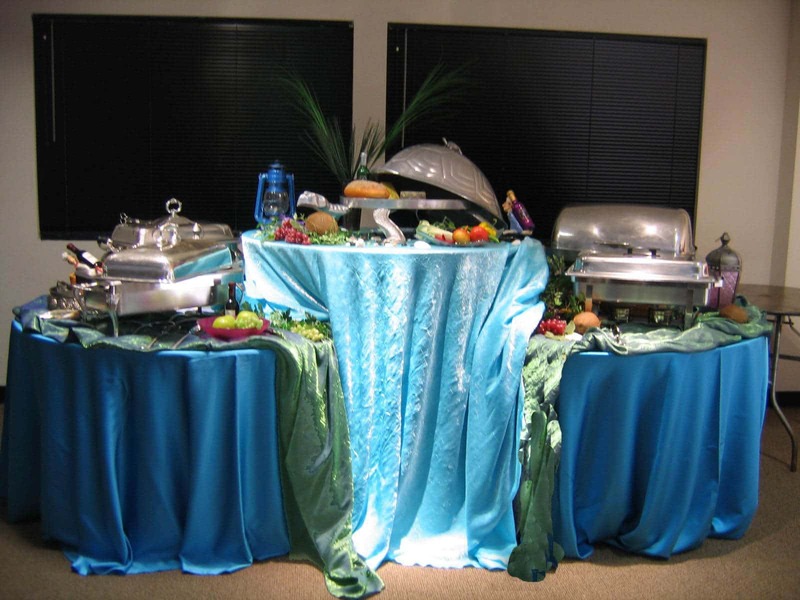 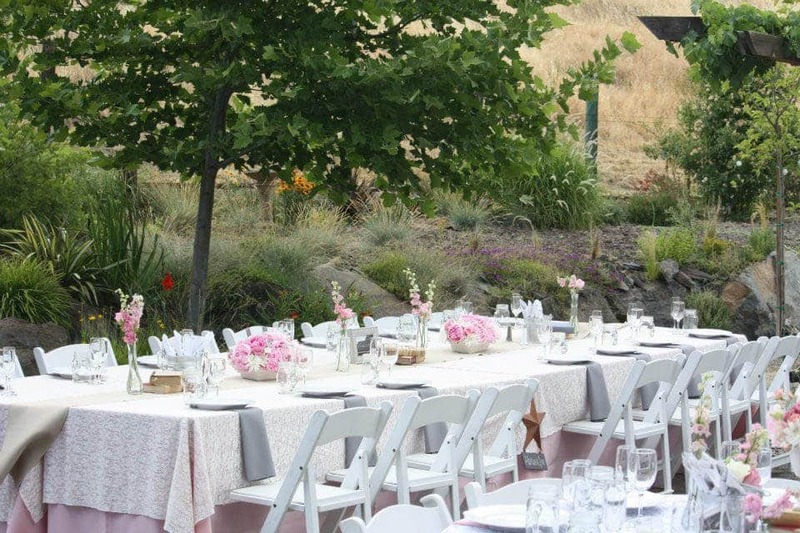 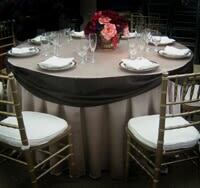 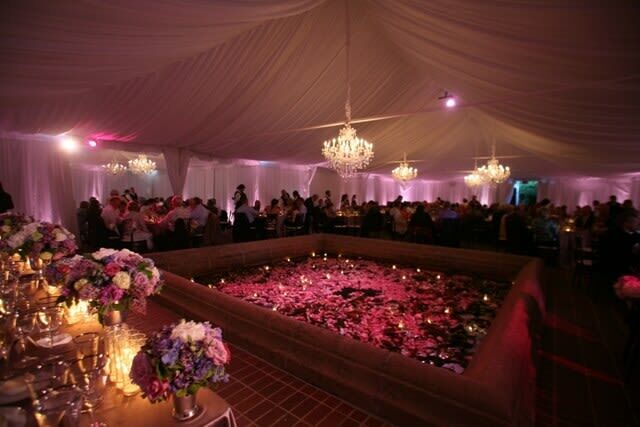 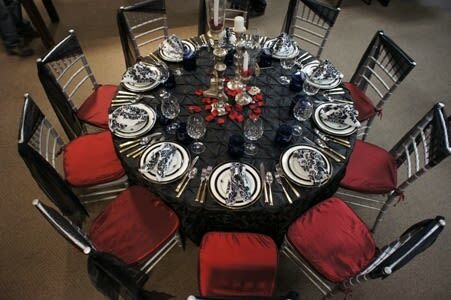 The next harvest table design showcases its performance within a fashionable and dignified wedding reception. 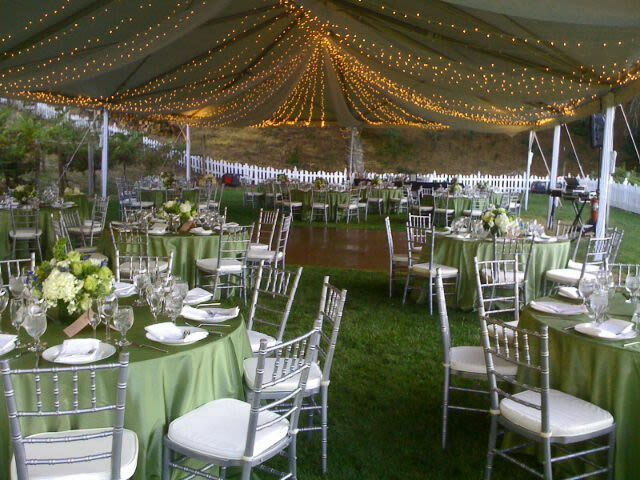 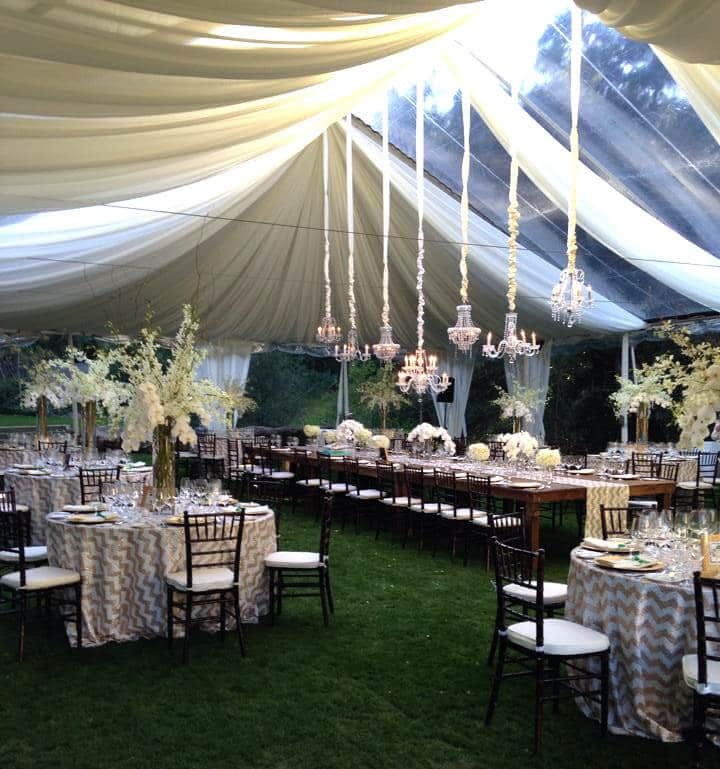 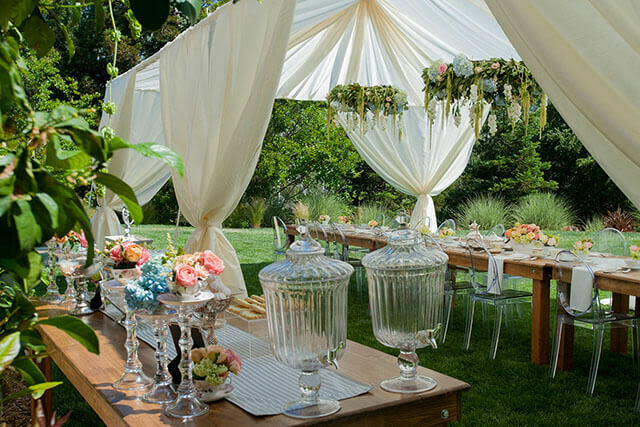 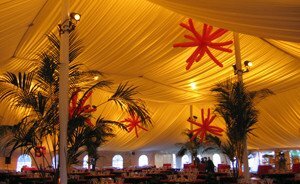 The wooden table and lush green grass flooring contrast beautifully with the bright white and gold palette of the tent swagging and décor. 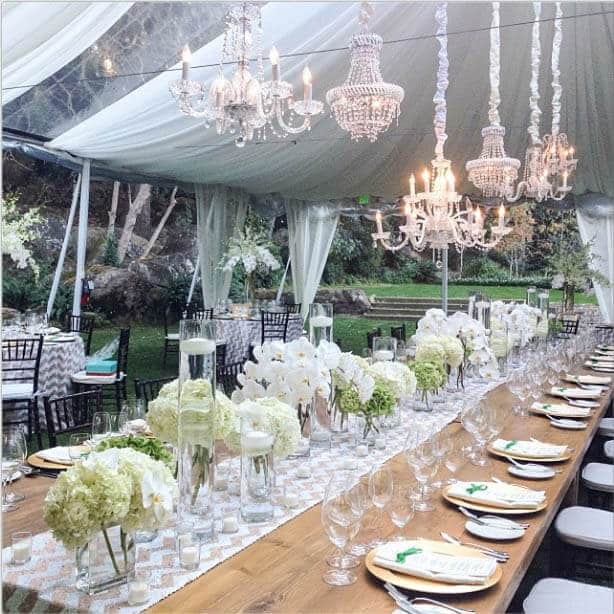 A gold and white chevron table runner reveals the wood of the table beneath it, while the many lit chandeliers set off the pristine glassware and glass vases. 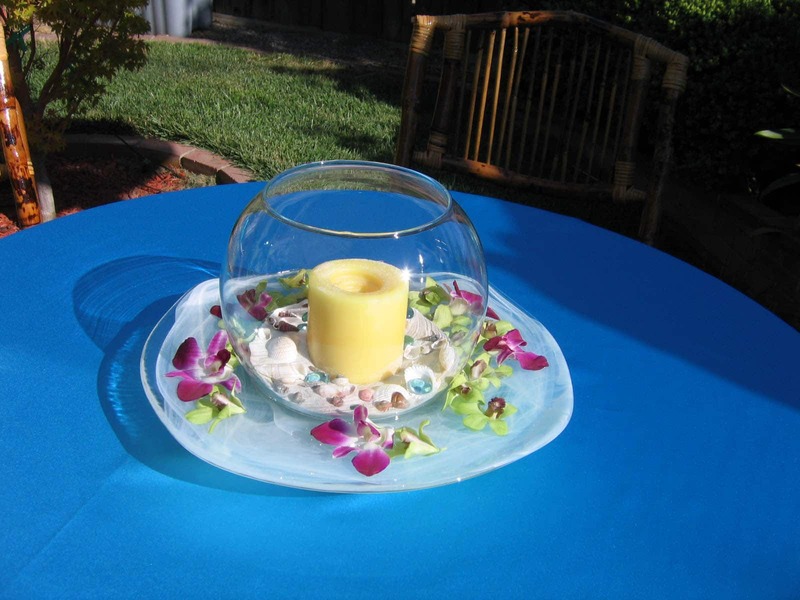 White and cream toned flower arrangements and small white candles are used as centerpieces, bringing together the clean, simple, yet elegant theme. 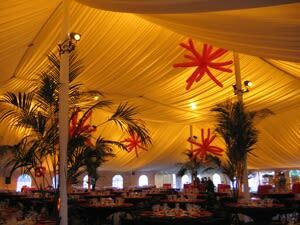 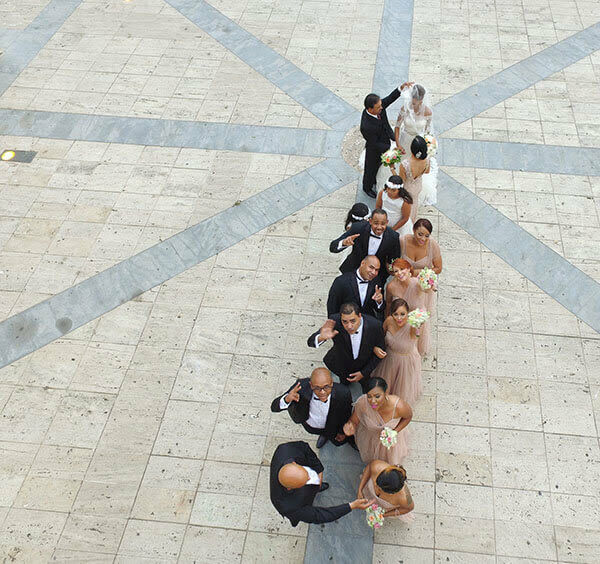 The final result is an exquisitely enchanting wedding reception amidst a natural, forest landscape. 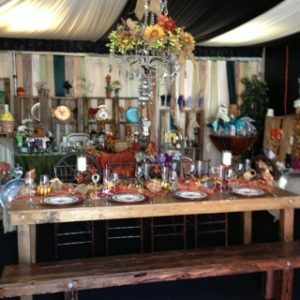 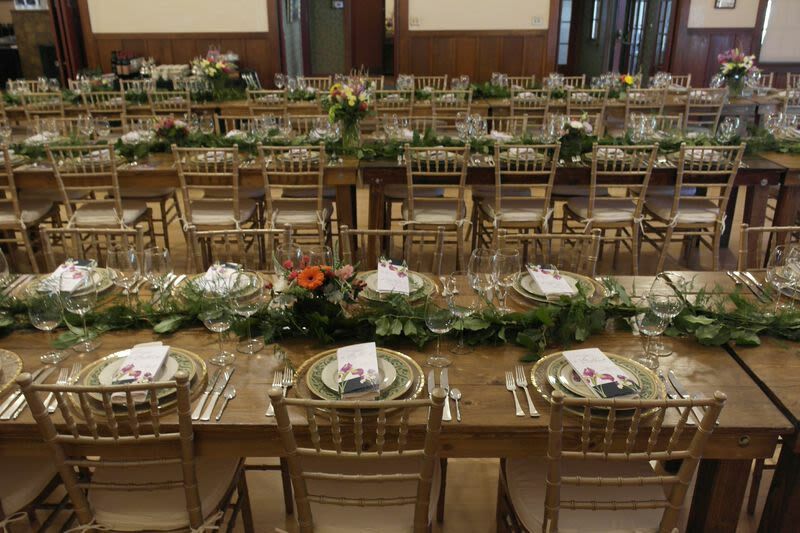 Harvest tables serve wonderfully in both informal and ornate settings. 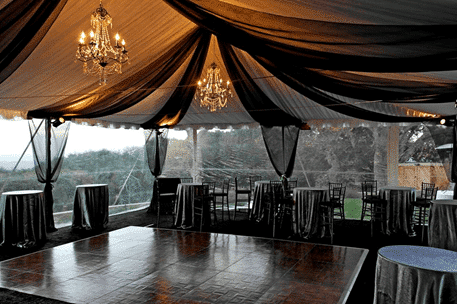 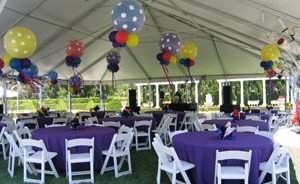 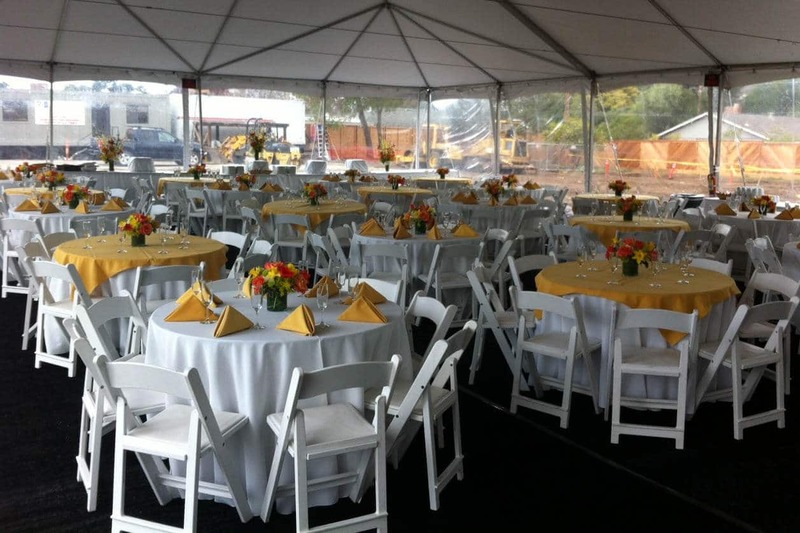 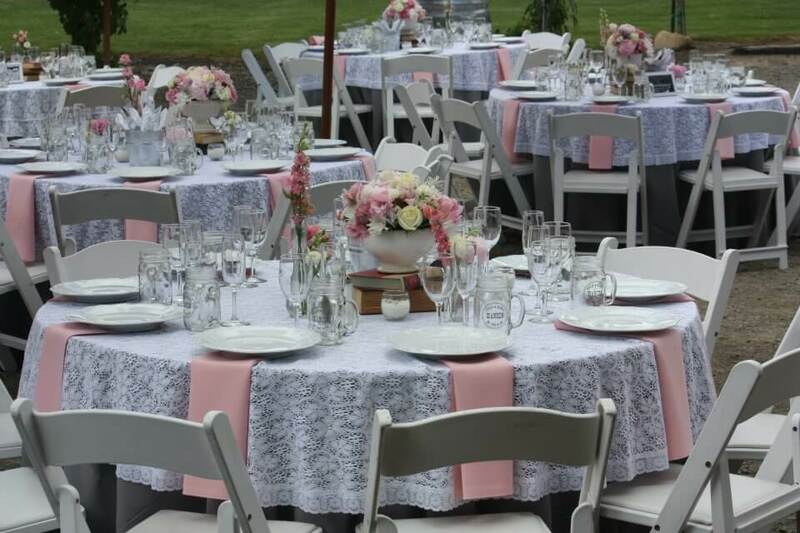 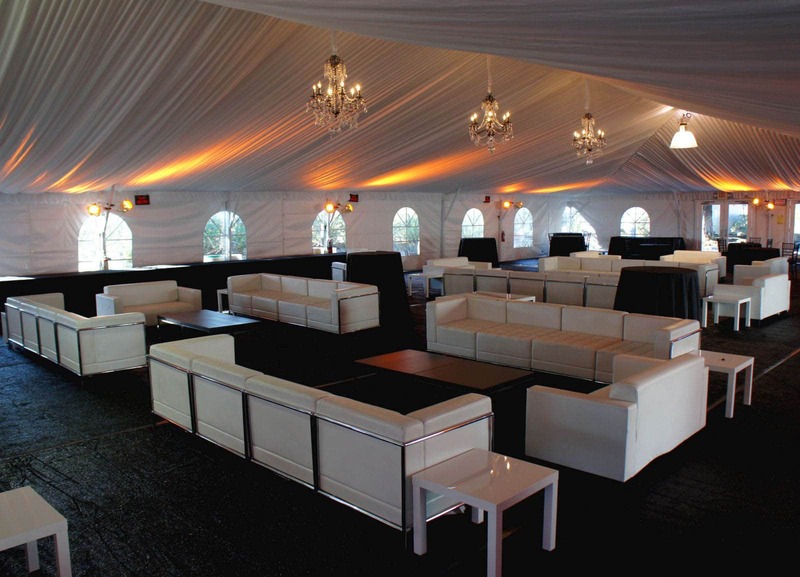 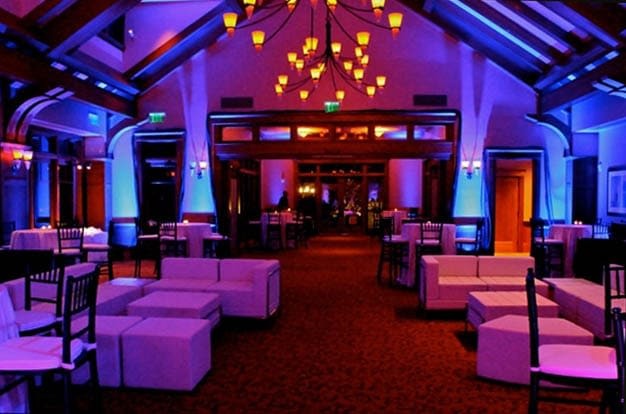 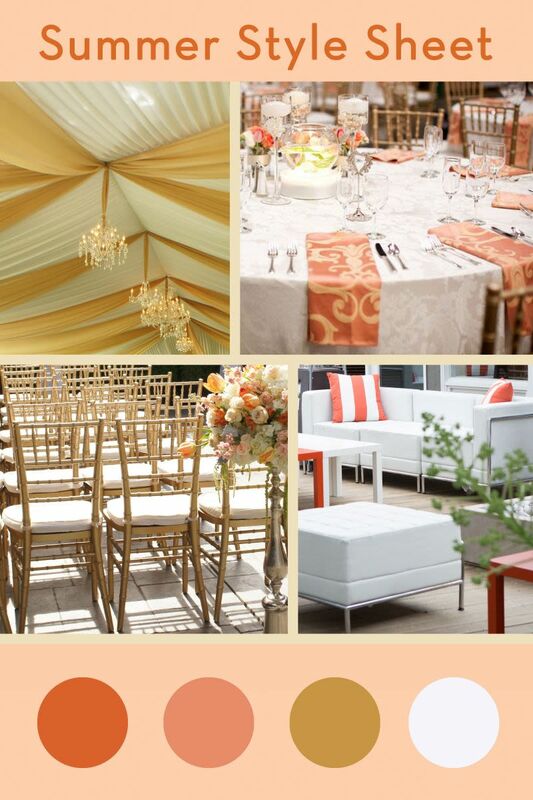 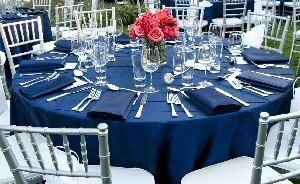 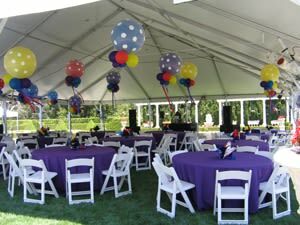 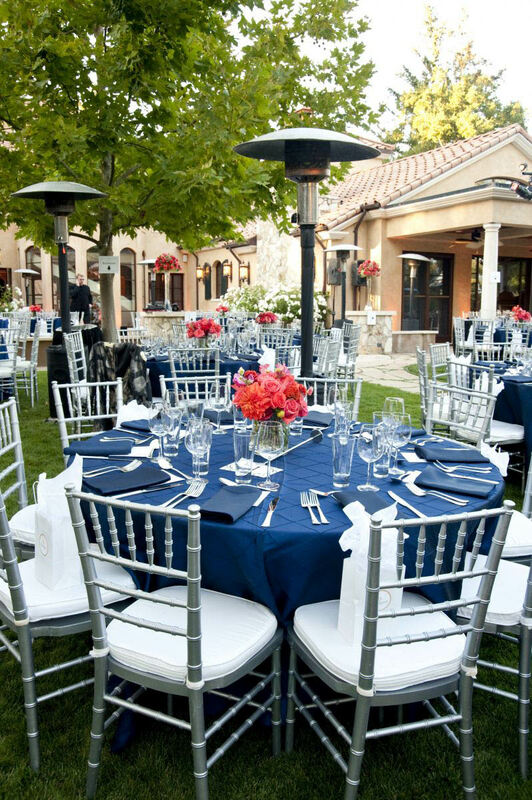 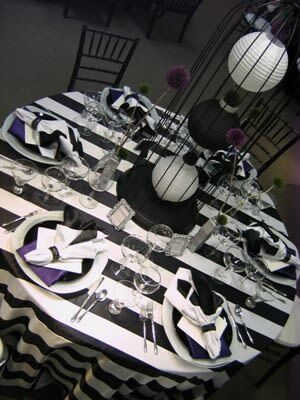 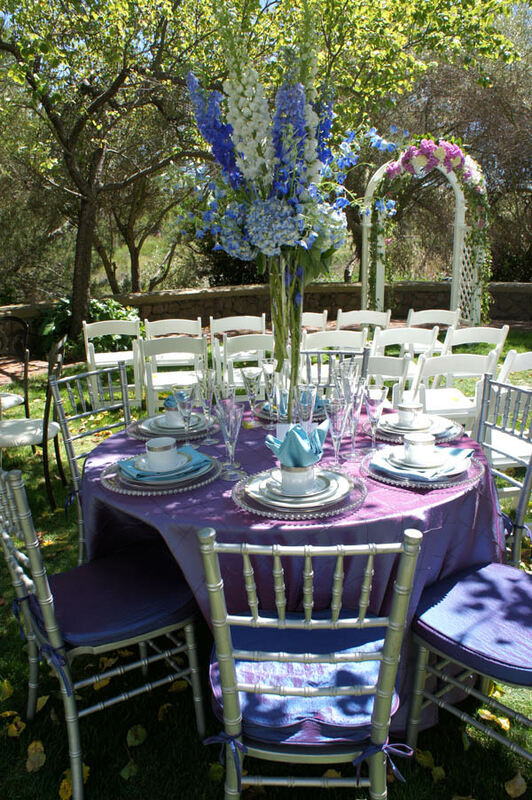 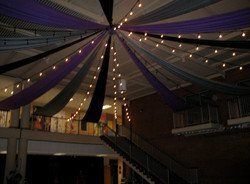 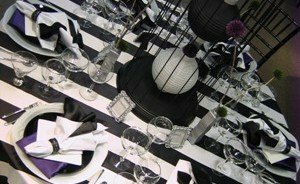 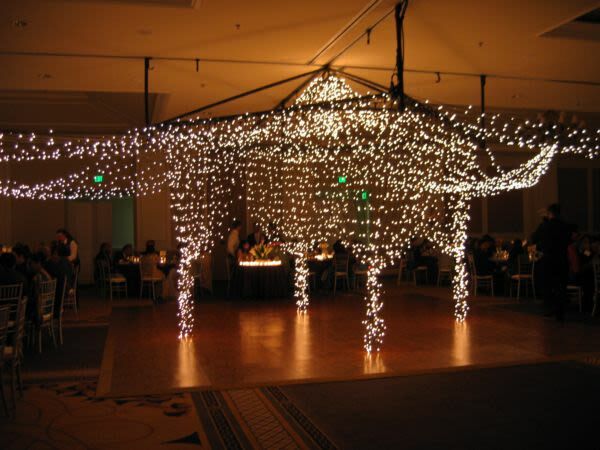 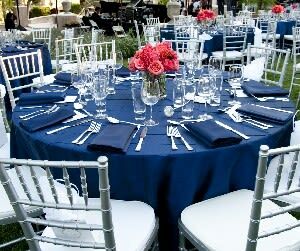 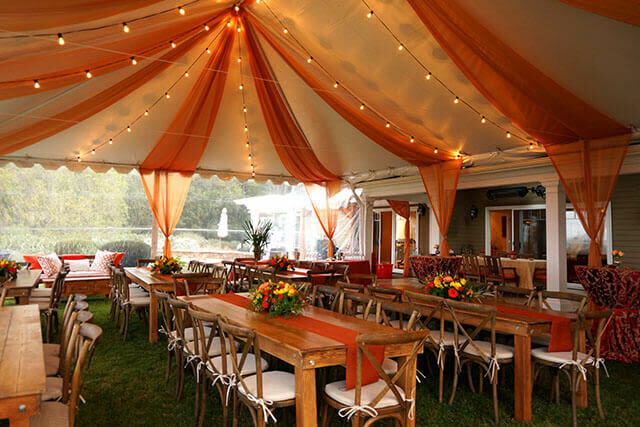 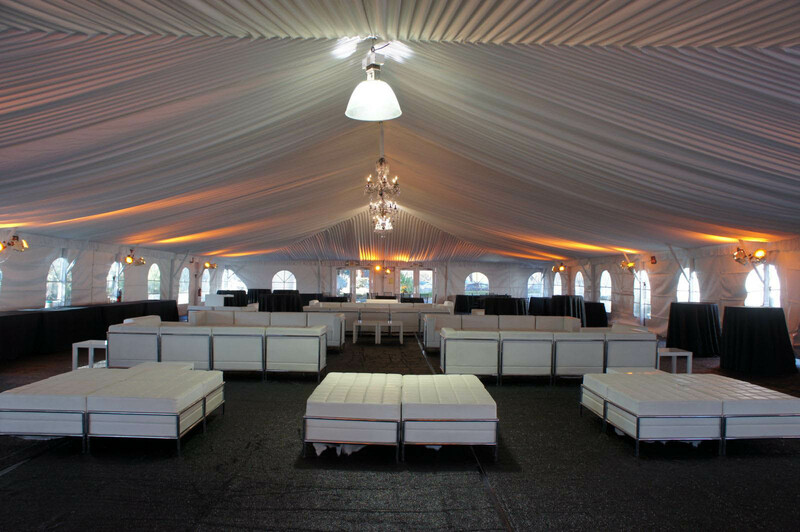 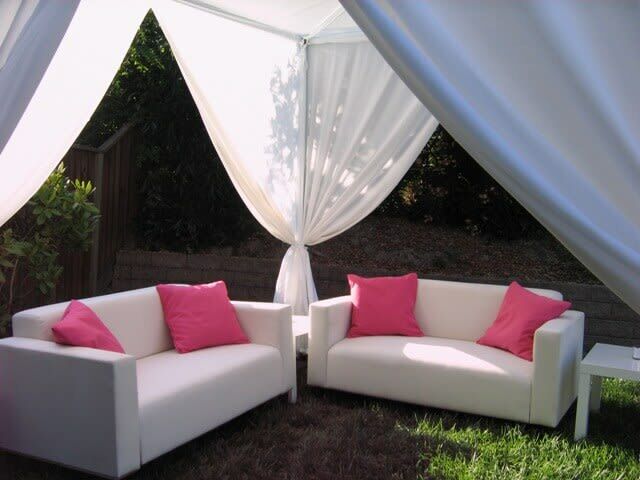 Pairing with chairs or benches provide drastically different looks, and various color palettes lend diverse appearances to the overall event venue. 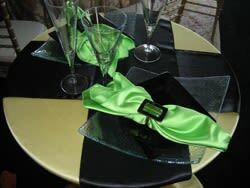 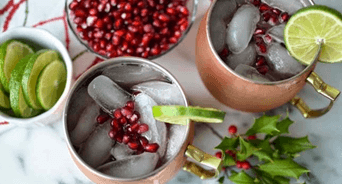 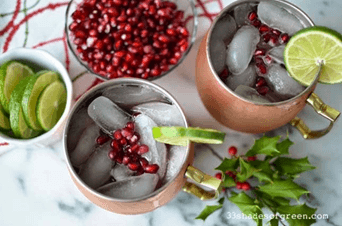 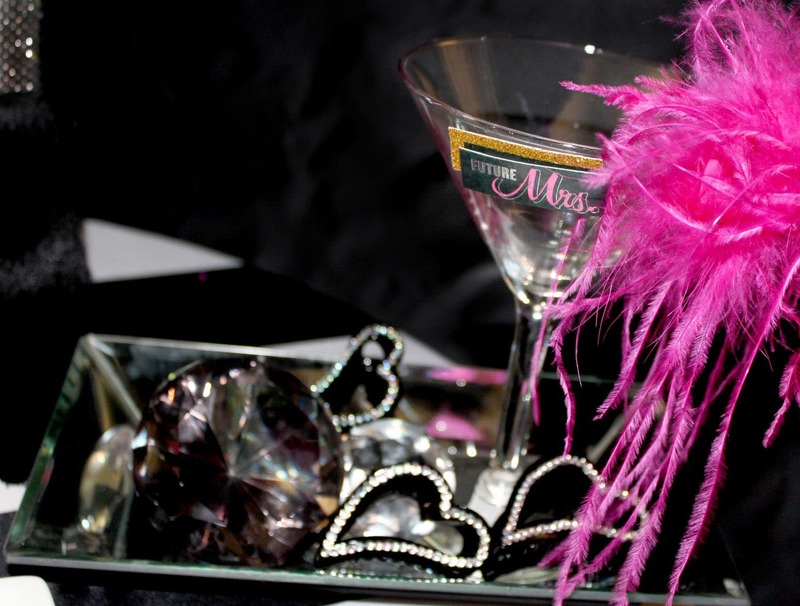 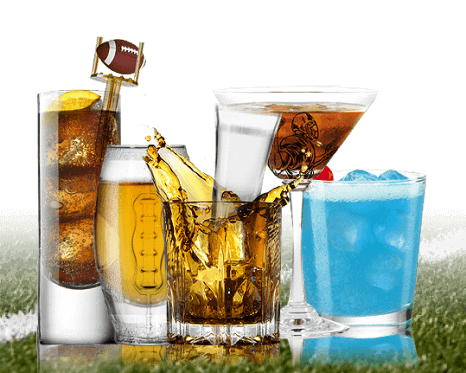 Try out a new look for this season’s parties, that is sure to please and impress.